Onondaga Lake is about 4.5 miles long, one mile wide, and lies in Central New York, next to the city of Syracuse. Ninemile Creek and Onondaga Creek are the lake’s two largest tributaries. Onondaga Lake Park, located on the lake’s eastern shore, is one of the most popular parks in Central New York. Rich in history, the lake has been sacred to Native Americans, including the Onondaga Nation, for thousands of years. The lake was a highly desirable area for European trappers and fisherman.During the late 19th century, European Americans built resorts, hotels, restaurants, and an amusement park along the lake’s shoreline. Throughout 1800s and 1900s the lake became a vibrant destination and commercial fishery. Its famous whitefish was a delicacy in New York City restaurants. Industry also boomed during this time period in part because the lake, its creeks, and rivers were major transportation routes during this period. Over time, domestic and industrial waste, due to industry and urbanization led to the severe degradation of the lake. By 1940 the lake was declared unsafe for swimming because of sewage and industrial pollution. In 1994 the lake’s bottom was listed as a Superfund site because of mercury contamination. Once known as the most polluted lake in the nation, Onondaga Lake has received significant attention over the last several decades. The lake’s upper water’s have undergone tremendous improvement because of efforts to remediate industrial and municipal pollution. Improvements to the county’s wastewater treatment plant as well as the reduction of combined sewer overflows (CSO) through the use of both grey and green infrastructure have led to the resurgence of the lake’s fishery. Helping with improvement efforts is the Onondaga Environmental Institute (OEI). A nonprofit organization, OEI has been focusing on the use of green and grey infrastructure throughout Onondaga County. In 2013 Onondaga Environmental Institute and its partners received $60,000 in EPA Urban Waters funding to train residents from impacted CSO-sheds in Syracuse on how stormwater can be mitigated using green infrastructure (GI) techniques. This effort helps support and reinforce Onondaga County’s award winning “Save the Rain” program. So far OEI and their partner, the L&M training center, have hosted two green infrastructure job training workshops for low-income, underemployed adults on Syracuse’s southside. Participants were taught life skills as well as how to create and maintain green infrastructure including urban forests, rain gardens, bioretention basins, rain barrels and green roofs. OEI also works with the Onondaga Earth Corps (OEC) to provide training to youth. Two, 16-hour, afterschool programs have been carried out by OEI and OEC staff to train young people, ages 15 – 25, about green infrastructure, job readiness, life skills, workplace safety, community outreach, and environmental justice. The City of Syracuse has a surprising amount of green infrastructure projects for a city its size. Green roofs, green streets, porous pavement, wetland restoration, and other methods are being implemented all over the city. OEI is providing job training for adults and youth in the field of green infrastructure as well as encouraging them to begin thinking critically about green infrastructure as a means to achieve clean water in their community. OEI is using their EPA funding for public education and outreach as well. With their partners, OEC and the Environmental Finance Center, they are encouraging residents to adopt and care for trees. A tree adoption workshop and three videos about tree care are providing residents with the tools they need to be stewards of their piece of the urban forest. delivering green infrastructure tours in partnership with the Environmental Finance Center; teaching the OEC youth about GI, stormwater runoff, and more. EPA’s urban waters funds have enabled OEI to empower Syracuse youth and adults to take part in water issues related to Onondaga Lake and are being used to help residents take ownership of their waterfront property. In addition there is now an ongoing collaboration and partnership between the L&M Training Institute and the Onondaga Earth Corps. A partnership that will continue to serve youth and adults beyond the life of OEI’s urban waters grant. The Onondaga Environmental Institute, a non-profit organization , has been a leader in Onondaga Lake issues since 1990. Their mission is to advance environmental research, education, planning, and restoration in Central New York. 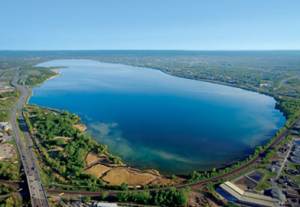 The “Save the Rain” program is a comprehensive stormwater management plan intended to reduce pollution to Onondaga Lake and its tributaries. During wet weather events, stormwater flows into the local sewer system,causing heavy flow periods that can overload the system.